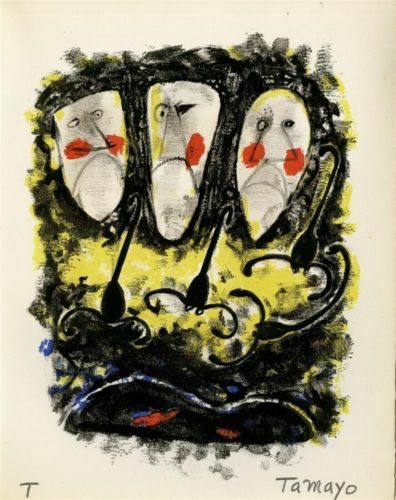 This is a rare limited edition HC (20) Hand Signed Lithograph, "Tres Mascaras y Tres Alacranes"" by Rufino Tamayo. Title: "Tres Mascares y Tres Alacranes"
Rufino Tamayo was born in Oaxaca, Mexico. He studied at the Academia de Bellas Artes in Mexico City and worked there until 1936 when he moved to New York, where he taught at the Dalton School and the Brooklyn Museum. He moved to Paris in 1954 and then back to his homeland ten years later. His style, while showing expressionist and semiabstract elements, is strongly indebted to native, ancient art forms. Tamayo says, with conviction, that the spirit and soul are still valid beneath our mechanized, over-hyped societal structure. In 1972 a street in Oaxaca was named after Tamayo, and in 1974 he donated a museum to that city for the permanent exhibit of his own extensive collection of pre-Columbian art. Tamayo has been honored with many prestigious awards. His work is frequently exhibited in galleries and museums throughout the world and is included in many important private and public collections. After the Mexican Revolution, Tamayo devoted himself to creating an identity in his work, and with his paintings, Tamayo expressed what he believed was the traditional Mexico, refusing to follow the more political trend that many of his contemporaries did, such as José Clemente Orozco, Diego Rivera, Oswaldo Guayasamin, and David Alfaro Siqueiros. Due to this choice, he was seen by some as a "traitor" to the political cause, and he felt he could not freely express his art, so in 1926, he decided to leave Mexico and move to New York. Prior to leaving, he organized a one-man show of his work in Mexico City, where he was noticed for his individuality. 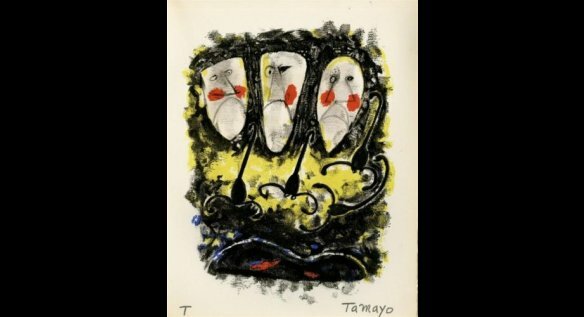 Tamayo returned to Mexico in 1929 to have another solo show, this time being met with high praise and media coverage. Tamayo and Luis Remba were the first artists who created a new type of printed artwork called "mixografía". Mixografía consisted of artwork printed on paper, but with depth and texture. One of their most famous mixografía was titled Dos Personajes Atacados por Perros ("Two Characters Attacked by Dogs"). Tamayo also painted murals, some of which are displayed inside Palacio Nacional de Bellas Artes opera house in Mexico City, such as Nacimiento de la nacionalidad ("Birth of the Nationality"), (1952). Rufino Tamayo started in his early days as a professional wrestler, at age 30 he stopped, and dedicated his life to painting portraits. From 1937 to 1949, Tamayo and his wife Olga lived in New York, becoming widely recognized, and he painted some of his most valuable works during that time. He had his first show in New York City at Valentine Gallery. He gained credibility and went on to show at Knoedler Gallery and Marlborough Gallery. In 1948 his first major retrospective was done at the Palacio de Bellas Artes in Mexico City, and while he was still controversial, his popularity was high. Still uncomfortable with the political differences and controversy, Tamayo and Olga moved to Paris in 1949, where he was welcomed by the artists of Europe. He remained in Paris for 10 years. On June 12, 1991, Tamayo was admitted to Mexico City's National Institute of Medical Sciences and Nutrition for respiratory and heart failure. He suffered an acute stroke and died on June 24, 1991.